Simply enter your email address below and we'll send you a FREE REPORT - Portugal: The Jewel of Southwest Europe. Mention Portugal to your friends and you may get different reactions. Some might say the country is on their bucket list, while others may express concern about the cost of living in Europe. Others might not even be sure where it is. One thing is certain: There’s no better place to begin discovering Portugal than in the cosmopolitan yet laidback village of Cascais, 20 miles west of Lisbon on the estuary of the River Tejo—also known by its former Roman name, the Tagus. 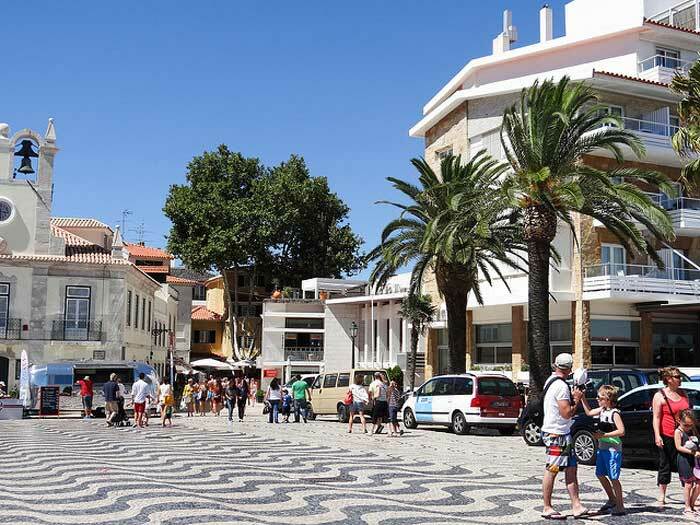 As you head west from Lisbon, you’ll encounter miles of sparkling shoreline, windswept dunes, and the pleasant beaches of Praia de Carcavelos, Praia da Conceição, Praia Rainha, and Praia Ribeira. But Cascais has not forgotten its origins as a fishing village. Seasoned fishermen still leave from shore in early morning, returning with their catch of sardines, crabs, mussels, robalo, dorado, and octopus. At lunch time, the men eat on the dock, family-style, from huge stock pots of simmering fish stew, sharing stories washed down with local wines. It’s not only the arresting beauty of the bay that charms locals and visitors alike. 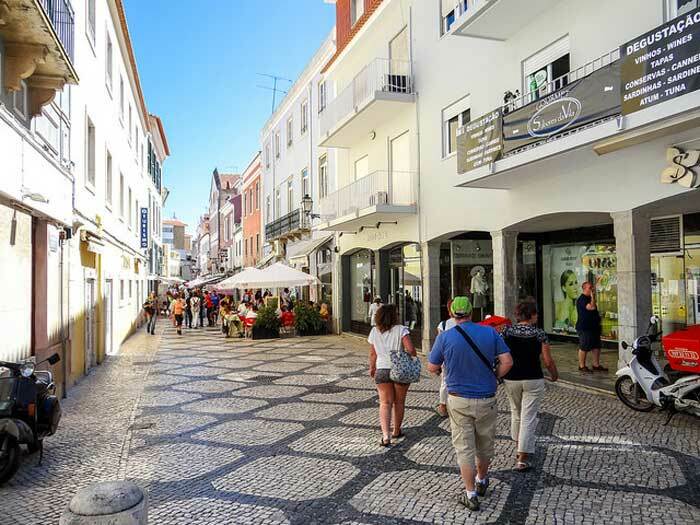 Cascais is known for its manicured parks, shops offering traditional items like pottery and lace, and upscale clothing boutiques like Max Mara and Hugo Boss. A multitude of restaurants provide outdoor seating, and there is even a museum or two, like the Paula Rego House of Stories, for the art or history buff. If you’ve had your fill of shoveling the snow from your driveway in winter or dealing with sweltering, humid summers, Cascais might be the answer for you. The town is blessed with a year-round moderate climate, with temperatures ranging from 55 F to 77 F. Golfing is nearby, and favorable sun and wind conditions make sailing, kite surfing, and windsurfing—in addition to traditional surfing—popular activities in this region whose economy hinges on tourism. It’s easy to get around Cascais by car, although parking can be tricky at peak holiday times. But it’s a great walking zone (wear comfortable shoes for the cobbled streets and hills you’ll encounter) and there’s an ever-present taxi queue in the center of town next to the carousel. To the north of Cascais is the wild and rugged surfing beach of Guincho, and farther still is Sintra, famous for its pastel-painted Pena Palace, Castle of the Moors, and National Forest. When you want to explore to the east, you can take the autostrada (highway) or the 30-minute train (Linho do Cascais) to the Cais do Sodré station in Lisbon and visit its many museums, parks, and districts like Alfama—the oldest neighborhood in the capital. If you have an urge to travel farther still, there’s a municipal airport nearby in Tires, and Lisbon Portela International Airport is just 45 minutes away. These factors—pleasant climate, lovely natural surroundings, accessible culture, and more—combine to make Cascais an ideal choice for retirement. Cascais has myriad inexpensive, free, and fascinating things to do and see, and it is a hub of diverse cultures. Sitting in a café you are likely to hear not only Portuguese and English, but also Spanish, German, French, Chinese, or Italian. Start your day at Sacolinha, the famous bakery on the main street of Avenida 25 de Abril. Choose a pastry or something more substantial, like a tosta de fiambre e queijo—how can you go wrong with grilled ham and cheese? Afterwards you might want to work off a few calories. Just a kilometer away is the dramatic seaside cliff formation of Boca do Inferno. When you’re done with your walk on the wild side, head back to the serenity of Portugal’s past, preserved in a beautiful villa off the beaten path in the Museu Condes de Castro Guimarães. On Wednesday and Saturdays, the market—aptly located on Rua Mercado—offers inexpensive clothing, handicrafts, and produce for sale in a festive atmosphere. Grab a bite to eat and stroll the waterside promenade toward Estoril. Stop in the casino—Europe’s largest—which James Bond graced with his presence while filming Casino Royale. You’ll find that Cascais is the perfect blend of city hustle and bustle and the calming influence of brilliant blue waters and pristine beaches. 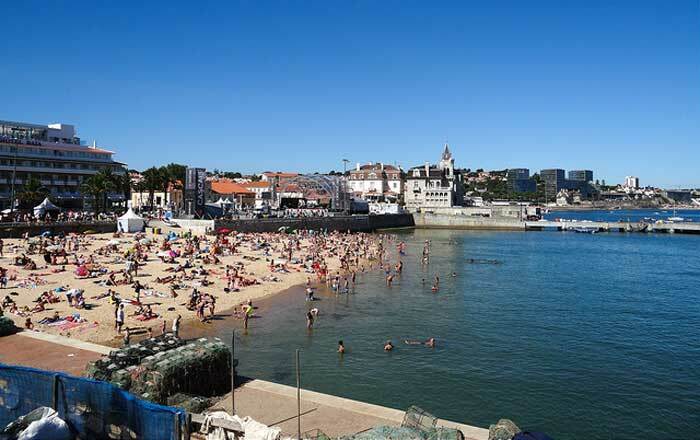 The village of Cascais is one of wealthiest municipalities in all of Portugal, but that doesn’t mean that it is to be dismissed as being too expensive. On the contrary, what it means is that the city is marvelously maintained. Streets are spotless. Red, yellow, and purple blooms burst from street lamp baskets, and roundabouts are decorated with intricately designed flower arrangements. Grocery shopping is convenient and inexpensive at the Hypermercado Jumbo. If you opt to live in a house instead of an apartment or condo, you might want to add a gardener to your budget. Generally, you can expect to pay about $25 per visit. Property taxes are based on real estate value. If you are considering buying a home, we suggest you work with a qualified, English-speaking professional to make sure you understand all costs associated with your purchase.